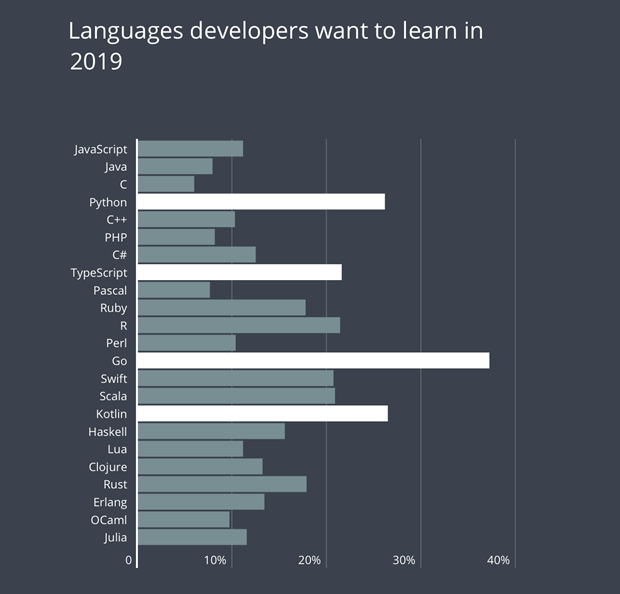 Go, created in 2007 at Google, is the top language that developers say they want to learn in 2019, followed by Kotlin, Python, and TypeScript. Other languages that are high on developers’ agenda for the next year include R, Swift, and Scala. TypeScript also rose from being the fifth most popular language to learn in HackerRank’s 2017 developer survey to the fourth most popular language to learn in its 2018 survey. TypeScript ranks eighth on HackerRank’s list of most popular languages in 2018. The ranking is based on what languages developers report they understand.